But my skein doesn't have THAT measurement! Disclaimer: Remember this is a weight conversion calculator, not a substitution calculation. 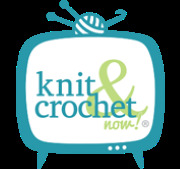 Sock, sport, worsted-weight, etc all should be converted to the same type yarn before making any calculations. and SAVE up to 44%! Print subscriptions available only in the United States and Canada. Live outside the U.S. and Canada? 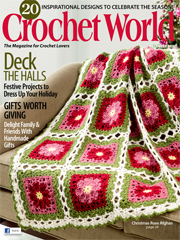 Click here to subscribe to the digital version. 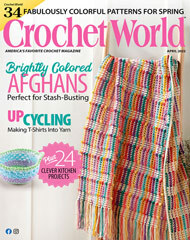 Crochet World is published 6 times per year at the cover price of $5.99 per issue. Canadian subscriptions will be charged an additional $9.98 per year plus GST/HST if needed.